Recently I watched two Korean TV series titled "Dae Jang Geum" and "Hwang Jin Yi". I would like to know about Korea’s traditional hairdo for women. Could you give some explanation about it? It seems very sophisticated. There are many, many different variations to traditional Korean hairdo, especially considering that Korea has a long history and the trends changed more than a few times. Also, the producers of historical dramas often take the liberty to innovate the existing styles to make the visuals of the drama more interesting. So the Korean will discuss the most prominent archetypes. For all of the hairstyles, you would notice that the word Meori being used a lot. Meori means "head", "hair on the head" (as opposed to hair on any other body parts), or "hairdo". The model in the picture is wearing an additional daeng'gi on the top of her head, called bae'ssi daeng'gi. Bae'ssi (배씨) means "pit of a pear," from which the shape of the ornament came. This additional adornment is traditional, but was not very common. Jjokjin meori is probably the most classic Korean hairdo, since the hairdo can be seen to this day. 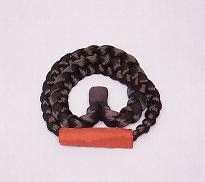 Jjokjin meori was for married women, formed by first parting and holding down the front part of the hair and then tying the hair into a bun in the back of the neck. 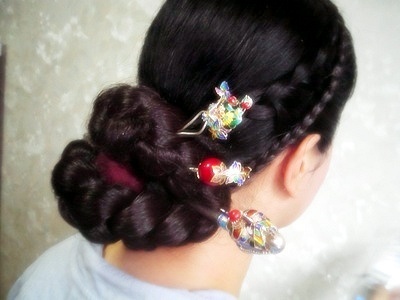 The large pin that holds the bun together is called bi'nyeo (비녀). The material and the design for bi'nyeo significantly varied, and offered a point of style for traditional women. Bi'nyeo could be made with gold, silver, jade, wood, bamboo, animal bones, etc., and the design included symbols for phoenix, dragon, wild ducks, lotus flowers, etc. The size of the bi'nyeo can also vary significantly -- some of the decorative bi'nyeos were as long as two feet. In addition to bi'nyeo, the bun can hold a number of other accessories. Most are purely decorative, but interestingly, some of the accessories are functional. For example, the buns could hold elaborate combs or long scoops for earwax removal -- almost like the way Marge Simpson holds a coin jar in her hair. As with daeng'gi meori, accessories can be added on the front part of the hair. Also a popular option among married women in traditional Korea. Instead of the bun being on the back of the neck, it "rested" (eon'jeun) on the top of the head. Notable thing about this hairdo -- and probably the reason why it did not survive as long as other hairdos did -- is that often, women used wigs to make their hair much more fuller. As you can imagine, they were heavy and very expensive. (Obviously, it takes human hair to make the wigs, and most people refused to cut their hair.) 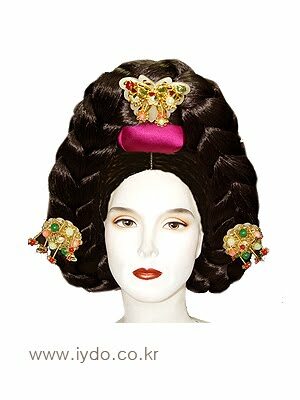 Because of that, there was a royal order in the mid-Joseon era prohibiting the use of wigs as they were deemed to be promoting wasteful spending as well as neck injury. Even today, the wigs are a significant enough burden for actresses who star in historical dramas such that some directors elect not to use the wigs although the drama might become historically inaccurate. Now we are moving on the hair worn by women in the palace. This hair is made almost exclusively with wigs. These are worn by queens, other kings' wives and queen mothers. Additional decoration (called tteoljam 떨잠) were added to create a more luxurious look. 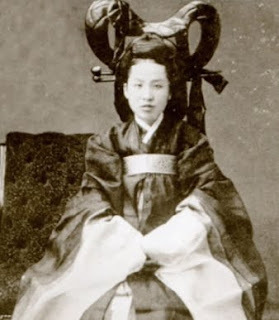 Empress Myeongseong, the last empress of Korea, with keun meori. 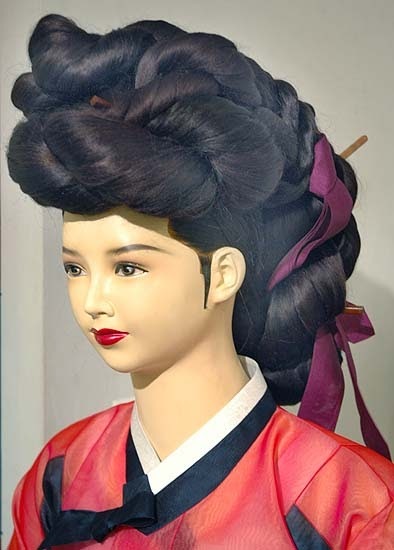 The mother of all traditional Korean hairdos. On top of the eo'yeo meori, a gigantic addition called tteoguji (떠구지) is affixed for, um, emphasis. Originally the addition used to be made with actual human hair (! ), but after the prohibition on wigs, it was made with wood carved and painted in black in order to make it resemble human hair. Apparently the wooden addition was actually lighter than the addition made with human hair. I was able to try on a hanbok at museum in Busan, which was pretty fun. But they put a large eo'yeo meori on top of my hair. Since I'm blond, it looked pretty ridiculous. But the hanbok was still fun to wear. Meori? If I heard someone actually pronounce "meori," it would sound like they're trying to say, "I'm a duck." I'm going to start a hair salon and call it Tuesdays With Mŏri. This is one of the many things I like about AAK! - a straight man covering hair styles is as rare as a politician who doesn't prevaricate. Much more creative than a western crown in my opinion! On a serious note, I wish that all the Westerners with an absurd fetish with anything Japanese (you know who you are) would look at something like this and realize that there ARE other cultures in Asia besides Japan's, and that some of these cultures are much older, just as impressive (if not more so in some aspects) and influential. Not to belittle the Japanese culture in anyway, but it frustrates me beyond words when I run into ignoramuses who believe that anything Asian and cool comes from and/or are influenced by Japan. Wow, "I Think, Therefore I am," there are other cultures outside of Nihon World? Damn, who knew? I wish that all the Westerners with an absurd fetish with anything Japanese (you know who you are) would look at something like this and realize that there ARE other cultures in Asia besides Japan's, and that some of these cultures are much older, just as impressive (if not more so in some aspects) and influential. Not me. I'd just as soon the fetishists stay away from Korea. Not to belittle the Japanese culture in anyway, but it frustrates me beyond words when I run into ignoramuses who believe that anything Asian and cool comes from and/or are influenced by Japan. Ah, but we need ways for the ignorami to out themselves. Seriously, though, thanks for this post. I'm a bit of a history/culture fan and this was right up my alley. I have seen some of the Korean dramas while my Mum watched them on the tube. For the longest time, I would sit there and imagine women who grew there hair really long just to do these do's. Now I know that wigs were involved. Haha! I guess I'll just go with the prettily braided bun with ornamental sticks.